Forrester Research today published an interesting and extensive analysis (via CNET) based on a large-scale poll of 10,000 information workers from North America and Western Europe, including 3,350 higher-ups that make purchasing decisions. The report, titled “Apple Infiltrates The Enterprise And Reshapes The Markets For Personal Devices At Work,” found out that 21 percent use one or more Apple devices (the figure includes gear they had brought in). Nearly half of businesses, or 46 percent, now issue Macs to their workers. That is up by more than half in two years (36 and 30 percent in 2010 and 2009, respectively). Moreover, hardware decision makers envision a 52 increase in Mac adoption in their companies this year. Out of those firms that issue Macs, a healthy 7 percent of all personal computers issued are Macs. The report said Macs in enterprise plus Microsoft’s poor mobile offering both signal that “Windows’ dominance is at an end.” This sounds a lot like Forrester’s take on the post-PC era. As for iPads and iPhones, 27 and 37 percent of companies officially support Apple’s tablet and phone, respectively. 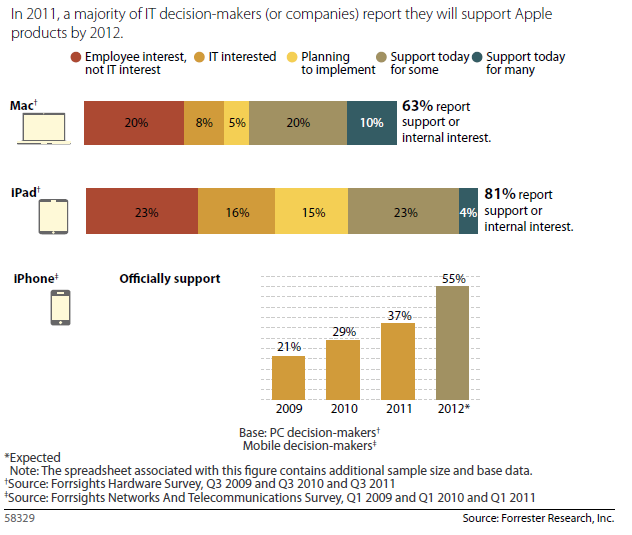 Things get even more interesting as 31 percent consider supporting the iPad in 2012 (55 percent for the iPhone). Microsoft cannot be too happy with this survey. So, who exactly gets to use Apple gear? Your bosses, that’s who! More information is available below.